Hard to believe it is Tuesday again! Thanks to all of you for sharing your great, eco-happy ideas here at Eco-Kids! Just had to share my eco-happy, garden-eating girlies, again! I had to smile when I saw these Clover Rings from Motherhood: My Latest Adventure! We make these almost everyday! Home Grown Montessori shared a sweet post about Summer Love! I am pretty excited to see these DIY Stainless Steel Drinking Straws from A Life Unprocessed! I love beeswax candles. I bought sweet little ones for the girls' birthday cakes. The smell is so soothing! 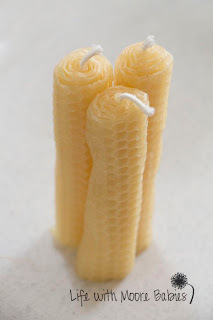 Life With More Babies shared her Bees and Beeswax Candles post with us! I am amazed at this wonderful Quiet Book that Jennifer at Deliberate Mom made for her little one! Thanks for hosting Hannah! I shared two posts today. One for pitting cherries without a pitter and the other for Almond Coconut Flour pancakes that are grain free and SCD/GAPS friendly. Thanks for hosting and featuring our beeswax candles! thank you for featuring our little rings! Thanks so much for featuring the quiet book I made. I'm honored to be featured on your blog. Thank you for inviting me to share my post! !